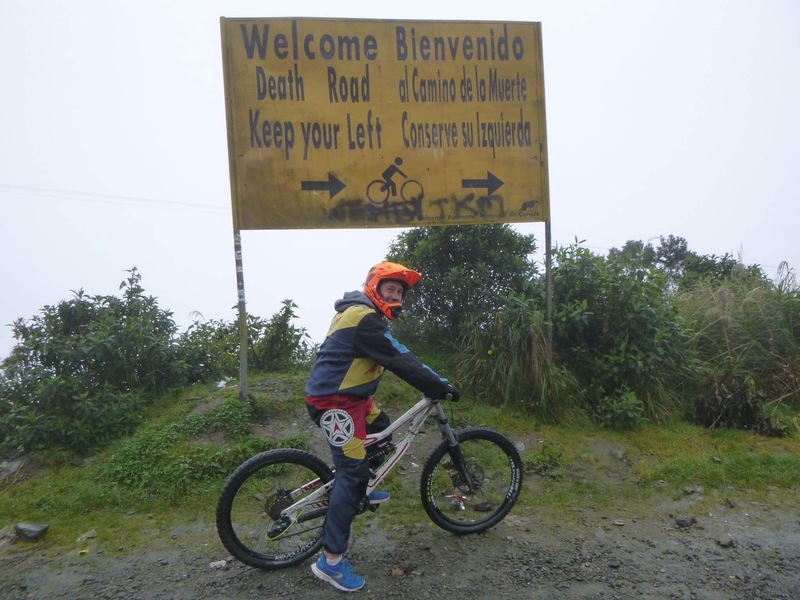 One of the main tourist sights in La Paz and Bolivia is the famous death road. A single lane dirt track, with a sheer drop down one side, that meanders through waterfalls and rivers for 30km. 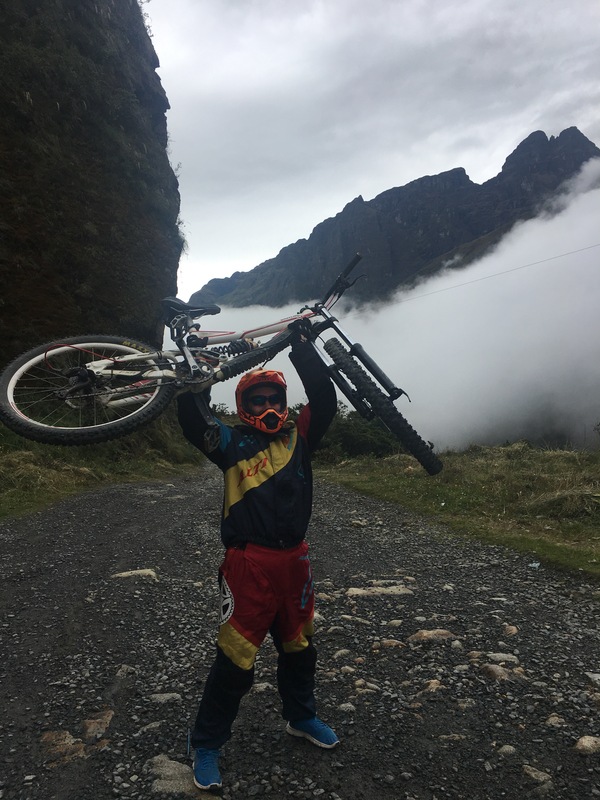 No need to explain how it got its name but since 2007 it is no longer used by Bolivian traffic as a highway through the mountains was built. Top gear famously came and drove along it in 2009, with great hilarity. Now it is a cycle track for adrenaline junkies and tourists. Most of the group decided they wanted to give it a go, and we were picked up at 8am by ‘altitude adventures’. As we were a large group of 12 we had our own tour guide and mini van. The bikes were all on top and ready to go. 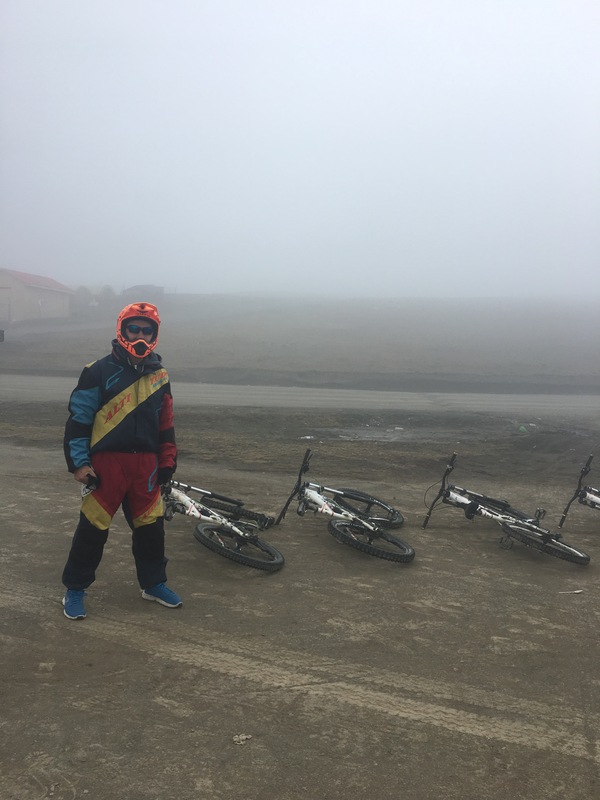 It was over an hour to the start of the cycle and we arrived at a cloud covered lake at 4450m. It was freezing cold as we got out of the bus and were given some breakfast. We changed into some jazzy racing overalls and were equipped with helmets and gloves. After some pictures and practise on the bikes we set off. 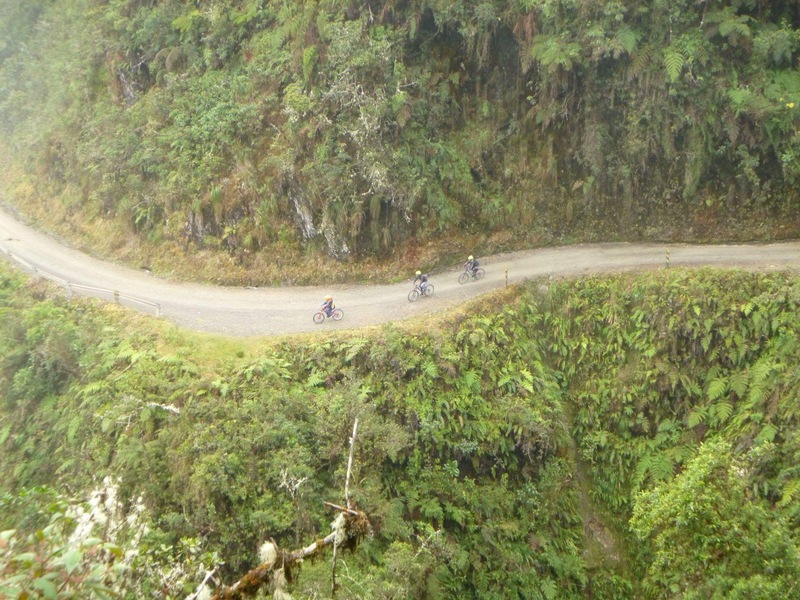 The starting 20km were not the death road itself but a mountain highway to the death road. It was bitingly cold and our hands seized up and went numb almost immediately. The road wound through the mountains and cloud providing spectacular views every time the cloud cleared. We stopped a couple of times to check everyone was ok; good thing too as one of our group came off her bike while overtaking a lorry as she brakes to hard. She was ok and just had a graze. We whizzed down the road and I overtook a couple of people and attempted to catch the leaders. It was exhilarating being alone, going as fast as I could and racing down the mountain. Just before we stopped I caught the leaders and then had a long wait for everyone else. We had stopped before a tunnel that cyclists weren’t allowed through and instead had to take a gravel path to the side. Once everyone had caught up and we had taken some photos we took the gravel path. One of the guides laid in wait to take photos as we all slipped and skidded on the gravel, I nearly fell off at this point! Our van was waiting on the other side and we loaded our bikes onto the roof to be taken uphill to the start of the death road. 10 minutes later we had arrived. A large yellow sign greeted us and we could see the narrow track ahead beckoning us forward. After some poses shots we were off. The cloud still clung to the mountain so we couldn’t see the sheer drop. Relief in some ways and terrifying in others as you had no idea how far you would fall. No barriers were provided so the only thing keeping you on the road were your white and brakes. The path was steep and later our guide told us we had been going at some points 40-50km per hour. After we had gotten use to the bumpy track and stopped a few times we were off. We often separated out so you couldn’t see anyone in front or behind. If you went off, I’m not sure anyone would find you. After an hour or so we stopped on a bend for photos. 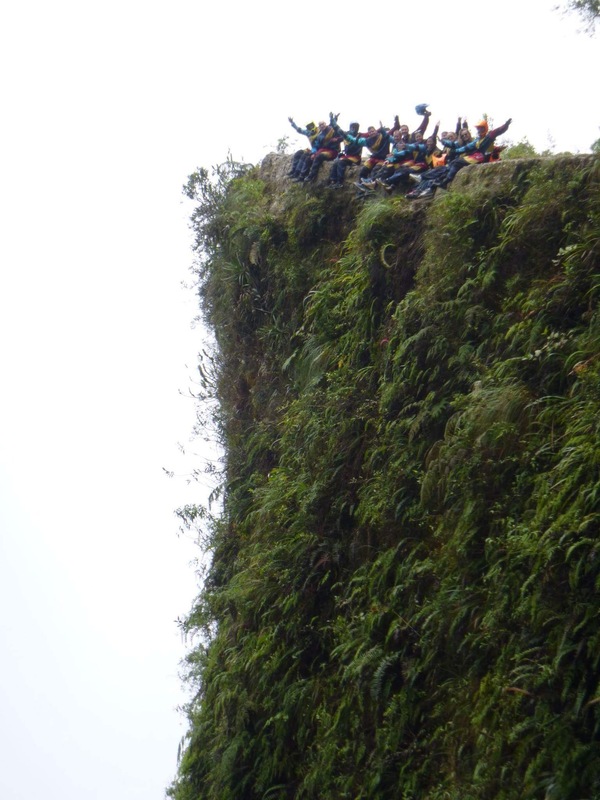 Other groups stopped here to, to take pictures on the cliff edge. We posed with our bikes and sat on the edge for a photo, our feet dangling in the air. Afterwards we continued and cycled on. This time I kept up with Marc and James and the tour leader as we sped down the path, under and through waterfalls. We stopped for lunch and had to wait 10/15 minutes before some of our other group caught up. Lunch was provided and we watched some zip liners go across the valley. The last section after lunch contained a bit of up hill which was exhausting and an exhilarating finish through 3 separate rivers. Unsurprisingly I got soaked and my trainers were ruined with the mud. We zipped down and I came 2nd (although it wasn’t a race!). Everyone was buzzing after the ride and we enjoyed a beer and recounted our tales. On the way back we first stopped at a hotel for some lunch/dinner and then continued back to La Paz, although the journey was now 3 hours. A long, long day but totally worth it. An amazing experience.